Want to try something different other than sugar cookies and fruit cake for Christmas? How about a classic Indian sweet recipe, Doodh Peda aka Milk Fudge, that makes for an ideal Christmas treat for family and friends. Pedas are rich, sweet and quick to make with hardly any preparation time. I made them over stove top which took a couple of minutes of cooking compared to Microwave. I have taken the short cut method to prepare Doodh Peda using condensed milk and milk powder. The traditional version of Doodh Peda is labor intensive but has a flavor and texture that is creamy and absolutely melt-in-the-mouth. 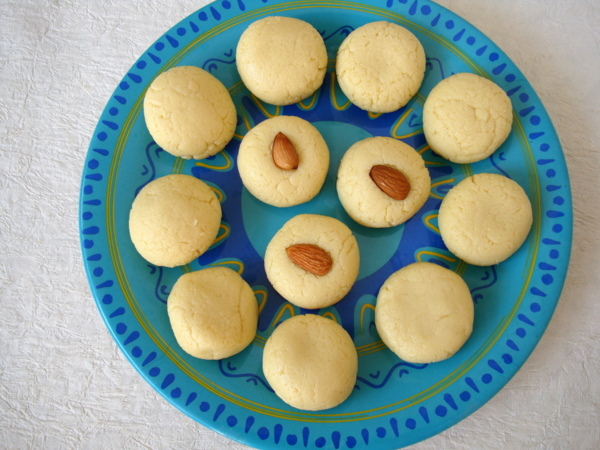 You can look forward to the traditional Pala Kova aka Doodh Peda recipe in a couple of weeks. I accidentally added more than required milk powder hence the cracked look of the pedas. 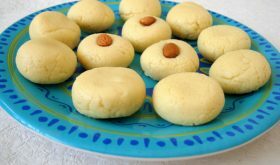 The key to a soft and smooth peda is to lightly grease your fingers and palm and roll out into small balls and go slow on milk powder. Melt the butter in a heavy bottomed vessel. Add the condensed milk and milk powder and mix well. Cook on low to medium flame, stirring constantly, till it becomes a thick paste. Turn off heat and allow to cool till you can handle the mixture with your hand. Lightly grease your fingers and palm, shape the milk powder mixture into small balls and flatten them slightly. You can decorate the doodh pedas with any nuts of your choice. Store the pedas in an air tight container and place in the fridge. 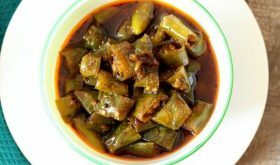 Remove the pedas from the fridge an hour before serving. You can have different flavored pedas. Substitute cardamom powder with a small pinch of saffron. Crush saffron and mix with 2-3 tsps milk, add to the peda mixture while its cooking and mix. Alternately, you can add 2 tbsps powdered pistachios to the peda mixture while its cooking. Or add 2 tbsp milk masala powder to the peda mixture while its cooking. This rich Indian dessert can be stored for a week in the fridge. By Sailu Published: December 12, 2011 How about a classic Indian sweet recipe, Doodh Peda aka Milk Fudge, for Christmas? Pedas are rich, sweet and quick to make dessert recipe with hardly any preparation time. Simply irresistible,cute pedas looks fabulous. how about sugar Sailu? did you use sweetened condensed milk? Yes, its sweetened condensed milk. we have to keep it with freezer? Fridge will do. No need to freeze. Awesome!Such a quick receipe. Can you post how to make crispy jilebi? Butter means white butter or can amul butter be used? Very nice to see the Doodh Pedas a wonderful sweat on the website. Thank you very much. I request you to show some more Andhra sweets for us to prepre them for the ensuing pongal. your receipies are fabulous………..can you tell me which brand milk powder you have used???????? I have updated the recipe. One tin of condensed milk is 300 ml or 400 g. You can use the whole tin (400 g) for the recipe. 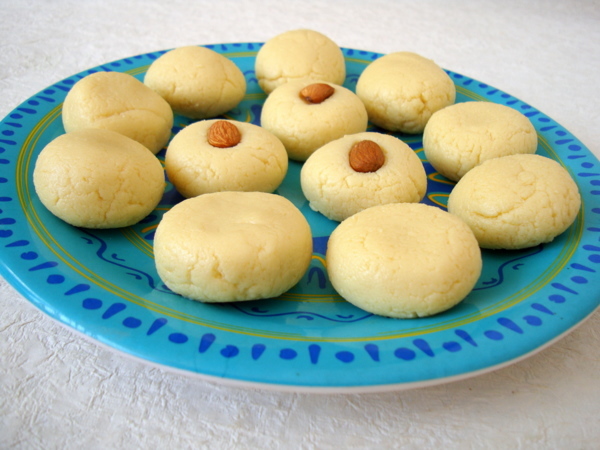 The traditional peda recipe calls for the use of milk. Its called Pala Kova in Telugu and I will blog the recipe using milk sometime. For this particular recipe you cannot use milk. wanted to know if i can make this in microwave? thanks.. Yes, it can be made in MW. i m really a big fan of kova…as soon as i saw ur recipe i couldn’t able to wait for preparing it……..
I’d suggest unsalted butter. You can try with Amul butter too. I was told that Carnation dry milk powder (non-fat version) works best. i dont have unsalted butter. Would ghee work instead? Yes, you can use ghee. I did milk fudge today everthing went good taste is nice but it is sticking to the mouth while eating. Can you please suggest me where i went wrong. Very simple yet delicious recipes, came out very perfect, but there was slight stickiness, while eating, but overall ek dam hit ha! I agree with some of the comments about stickiness but overall these were delicious! Doodh peda without a sweetener? I mean no sugar added? @&^%?$&%%@@!!!!! Is the milk powder the instant kind we find in US supermarkets or the non-instant kind we find in health food stores? Its instant kind of milk powder. Hi, so this recipe is without sugar? or at what point should we put sugar and how much, nobody noticed this? or everybody is making this without sugar??? You are using sweetened condensed milk hence you do not need sugar. For the Instant Doodh Pedha or Milk Fudge, there’s no mention of sugar. Is it an oversight on your part or the recipe does not contain sugar? Please clarify and thank you very much for sharing your recipes with others. i am not being able to roll the mixture into pedas or rolls as it too liquid even after it has cooled. please help. Thanks for the recipe. I prepared this for New Year, it was prefect. My husband loved it. Thank you once again. Can we try alone with milk powder and full cream milk instead of condensed milk?? Hi, I am really happy to have tried Peda, it became a hit with kids.